Ingredients: Aqua, Magnesium Bitterns, Vitis vinigera Oil (Grapeseed Oil), Cetearyl Alcohol, Aloe barbadensis Leaf Juice, Prunus armeniaca Oil (Apricot Oil), Santalum acuminatum (Qandong Extract), Stearic Acid, Polysorbate 60, Simmondsia chinensis Oil (Jojoba Oil), Oryza sativa Oil (Rice Bran Oil), Benzyl Alcohol, Tocopheryl, Allantoin, Coco Caprylate, Salicylic Acid, Glycerin , Sorbic Acid, Jasminium grandiflorum Oil, Citrus bergamia Oil, Aniba rosaeodora Oil. Specially formulated to hydrate and protect against dryness and restore your skin’s moisture balance. I have skin that tends to be oily & I live in the tropics where it is difficult to use a moisturizer because it usually "slides" off your face because of the humidity & sweat! I have found this cream is completely absorbed despite this & am now hooked on using it. My skin has benefited so much - it's very soft & I feel it has reduced some of my wrinkles - maybe that's wishful thinking but I am very happy with it. I love love this moisturising cream, I put rose hip oil under cream. My face is win win with both these products. Simply the best. 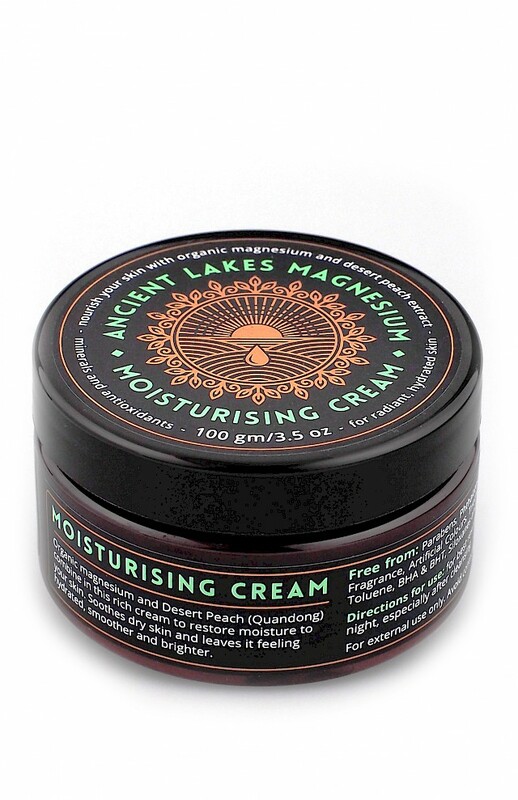 Well done Ancient Lakes..... great products. I love this cream, feels great on the skin and also helps with any blemishes or sunburn and its all natural! I keep this product at my desk at work. Perfect remedy to drying air-con and indoor heating in Canberra. Thick and a little goes a long way. My family keep pinching mine! Absolutely the best fantastic products leaving you skin silky and smooth.Being diabetic getting hot skin this product cools the skin whilst moisturising the dry skin and replenishing my body’s magnesium levels. My family keep pinching mine! Lots of magnesium products out there, this one is the best!! Skin looks and feels soft and "plump"
it feels very smooth and if I forget to apply it still feels the same at the end of the day !! Light, super absorbent, non greasy, delicately scented.. The difference to my skin ..it is softer, more even toned and textured. It is wonderful on burns, sores, bruises, scratches....a first aid kit in a lovely jar !! !